The Palais ( Palace) construction began in AD 1252. Avignon became the residence of the Popes in 1309, when the Gascon Bertrand de Goth, as Pope Clement V, unwilling to face the violent chaos of Rome after his election (1305), moved the Papal Curia to Avignon, a period known as the Avignon Papacy. Clement lived as a guest in the Dominican monastery at Avignon, and his successor Pope John XXII set up a magnificent establishment there, but the reconstruction of the old bishops’ palace was begun in earnest by Pope Benedict XII (1334–42) and continued by his successors to 1364. The site, on a natural rocky outcrop at the northern edge of Avignon, overlooking the river Rhône, was that of the old episcopal palace of the bishops of Avignon. The Palais was built in two principal phases with two distinct segments, known as the Palais Vieux (Old Palace) and Palais Neuf (New Palace). By the time of its completion, it occupied an area of 11,000 m2 (118,403 sq ft). The building was enormously expensive, consuming much of the papacy’s income during its construction. The Palais Vieux was constructed by the architect Pierre Poisson of Mirepoix at the instruction of Pope Benedict XII. The austere Benedict had the original episcopal palace razed and replaced with a much larger building centred on a cloister, heavily fortified against attackers. Its four wings are flanked with high towers. Under Popes Clement VI, Innocent VI and Urban V, the building was expanded to form what is now known as the Palais Neuf. An architect, Jean de Louvres, was commissioned by Clement VI to build a new tower and adjoining buildings, including a 52 m long Grand Chapel to serve as the location for papal acts of worship. Two more towers were built under Innocent VI. Urban V completed the main courtyard (known as the Court d’Honneur) with further buildings enclosing it. The interior of the building was sumptuously decorated with frescos, tapestries, paintings, sculptures and wooden ceilings. 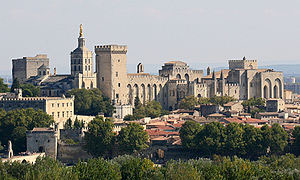 The popes departed Avignon in 1377, returning to Rome, but this prompted the Papal Schism during which time the antipopes Clement VII and Benedict XIII made Avignon their home until 1403. The latter was imprisoned in the Palais for five years after being besieged in 1398 when the army of Geoffrey Boucicaut occupied Avignon. The building remained in the hands of antipapal forces for some years – it was besieged from 1410 to 1411 – but was returned to the authority of papal legates in 1433. Although the Palais remained under papal control (along with the surrounding city and Comtat Venaissin) for over 350 years afterwards, it gradually deteriorated despite a restoration in 1516. When the French Revolution broke out in 1789 it was already in a bad state when it was seized and sacked by revolutionary forces. In 1791 it became the scene of a massacre of counter-revolutionaries, whose bodies were thrown into the Tour des Latrines in the Palais Vieux. The Palais was subsequently taken over by the Napoleonic French state for use as a military barracks and prison. Although it was further damaged by the military occupation, especially under the anti-clerical Third Republic, when the remaining interior woodwork was cleared away for use of the structure as a stables – the frescos were covered over and largely destroyed – ironically this ensured the shell of the building’s physical survival. It was only vacated in 1906, when it became a national museum. It has been under virtually constant restoration ever since.